The national flag of the Union of the Comoros (officially French: Union des Comores, Comorian: Udzima wa Komori, Arabic: الاتّحاد القمريّ‎, al-Ittiḥād al-Qamarī) was designed in 2001 and officially adopted on January 7, 2002. It continues to display the crescent and four stars, which is a motif that has been in use in slightly various forms since 1975 during the independence movement. In its constitution, the government of the Comoros refers to the insignia as l'emblème national, or the "national emblem", though it is understood to actually represent a flag. The design consists of a white crescent with four white five-pointed stars inside of a green triangle. The flag has four stripes, representing four islands of the nation: yellow is for Mohéli, white is for Mayotte (claimed by Comoros but administered by France), red is for Anjouan, and blue is for Grande Comore. The four stars on the flag also symbolize the four islands of the Comoros. The star and crescent symbol stands for Islam, which is the nation's major religion. The stars point usually point up as reflected in the model supplied when the flag was adopted, but legal documents concerning the flag do not specify the flags orientation and there is a variant in which the stars point outwards and not up. The first official flag of Comoros was designed and adopted for local use in 1963 by Suzanne Gauthier, before Comoros gained its independence. It had a white crescent at upper hoist facing the fly, four stars in a diagonal, and used a 5:7 proportion with a green background. This design continued to be used after independence in 1975. The flag changed in 1975 under Ali Soilih. The crescent was moved and the stars were rearranged into a diamond. Two thirds of the flag became red and symbolized the regime's socialist ideology. When Ahmed Abdallah was returned to the presidency in 1978, the flag changed again. It returned to being completely green, with the crescent moving to the center of the flag and the stars forming a line between its horns. Information about the proportions of this variant suggest either a 1:2, 2:3, or 3:5 ratio. With the adoption of a new constitution in 1992, the flag changed again such that the crescent and stars were rotated to face upward rather than down and to the right. The adoption of yet another constitution changed the flag again in 1996, rotating the flag to face the fly and adding a white inscription to the lower hoist and another to the upper fly. The inscriptions are written in simplified Arabic with the former reading "Muhammed" and the latter reading "Allah". The proportions of this flag were reported to be 21:15. This flag was changed by referendum in 2001 to the modern one. 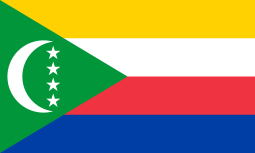 ^ Flag History of Comoros. Al Akhbar page on the flag of the Comoros. Retrieved on 2014-07-07. ^ a b c Berry, Bruce (10 March 2016). "Comoros". Flags of the World. Retrieved 17 October 2016. ^ a b "Flag of Comoros". Gettysburg Flag Works. Retrieved 17 October 2016. ^ a b Berry, Bruce (10 March 2016). "Comoros (1963 - 1975". Flags of the World. Retrieved 17 October 2016. ^ a b Berry, Bruce (10 March 2016). "Comoros (1975 - 1978)". Flags of the World. Retrieved 17 October 2016. ^ a b Berry, Bruce (10 March 2016). "Comoros (1978 - 1992)". Flags of the World. Retrieved 17 October 2016. ^ a b Berry, Bruce (10 March 2016). "Comoros (1992 - 1996)". Flags of the World. Retrieved 17 October 2016. ^ a b Raeside, Rob (10 March 2016). "Comoros (1996 - 2001)". Flags of the World. Retrieved 17 October 2016. Flag of Comoros at the Encyclopædia Britannica. This Comoros-related article is a stub. You can help Wikipedia by expanding it.